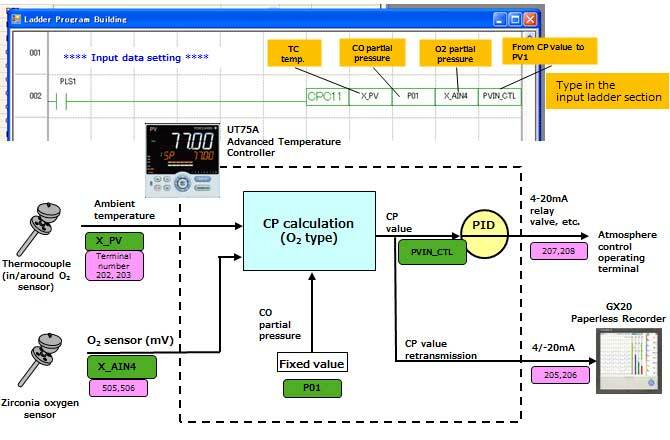 Adding the CP calculation option to the advanced UT75A Digital Indicating Controller enables CP (Carbon Potential) control. CP calculation can be carried out with just one line of a UT75A ladder program. * High impedance input is required for zirconia sensors. Select auxiliary analog (remote) input. The UT75A's CP calculation supports all manufacturer's zirconia oxygen sensors. For concerns about calculation errors, you can apply correction using polygonal line bias. If you will be using your own CP calculations, you can easily create original ladder commands with the LL50A parameter setting software's custom ladder function. The formulas of you original ladder commands can be password protected. Also, the UT75A comes standard with a program pattern function. 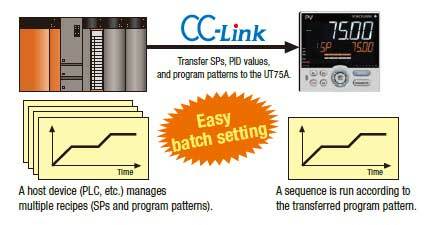 CC-Link, DeviceNet, and PROFIBUS-DP can be installed as options, and easy connection with PLC is available allowing transfer of program patterns to the UT75A from a PLC that manages recipes, and programs can be run. 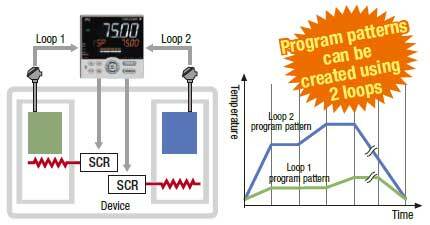 CC-Link, PROFIBUS-DP, and Device Net are supported, making it easy to link up with PLCs that manage recipes. The UT75A temperature controllers employ an easy-to-read, 14-segment large color LCD display, along with navigation keys, thus greatly increasing the monitoring and operating capabilities. A ladder sequence function is included as standard. The short depth of the controller helps save instrument panel space. The UT75A also support open networks such as Ethernet communication.